So the End Times have finally come. It's a bold move from Games Workshop. Let's see if it pays off. This has turned out a much longer post than I usually do and it rambles on a bit in places, in fact most of it rambles but I hope you enjoy this review anyway. I will start with some general comments, work may way through the two books and end on a bit of a conclusion. Moving the story forward is certainly a great way to reinvigorate interest in the system and it was certainly enough to get me to buy a £50 book. It is in fact two books contained within a rather stylish slipcase: the first is a huge 300 pageish volume focused on fluff and the second is about 100 pages of various rules. The entire thing is quite beautiful; it is not only well presented but is replete with new artwork and vast amounts of literary content. So much content in fact that it has taken me about two weeks to read and properly digest it all. This is a must have for any avid Warhammer collector and lovers of the background such as myself. I think this can only be a good thing for the game by allowing it to change and grow in new directions. Whilst I love the Warhammer world I am excited by the opportunities moving the story forwards entails and I can say now that it seems far better executed thus far than Storm of Chaos. The background book is a lovely tome that looks to have had an insane amount of time poured into it and is practically Forge World levels of quality. 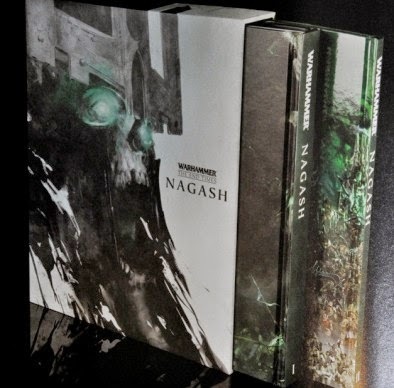 In fact I would argue that both Nagash books together make one of the best publications that has come out of the studio in a long time. The writing is good, in fact in many places excellent, being far above the regular fare we see in Codexes and Army Books. The book revolves around the resurrection of Nagash in response to Archaon finally amassing his armies to begin the End Times. The story kicks off soon after the events of Sigmar's Blood (which seems to be like a prequel but not required reading) and gives us a good overview of how each faction reads the portents and prepares to deal with the impending Chaos invasion. Whilst the focus is undoubtedly on the Undead; all factions are covered to some degree. 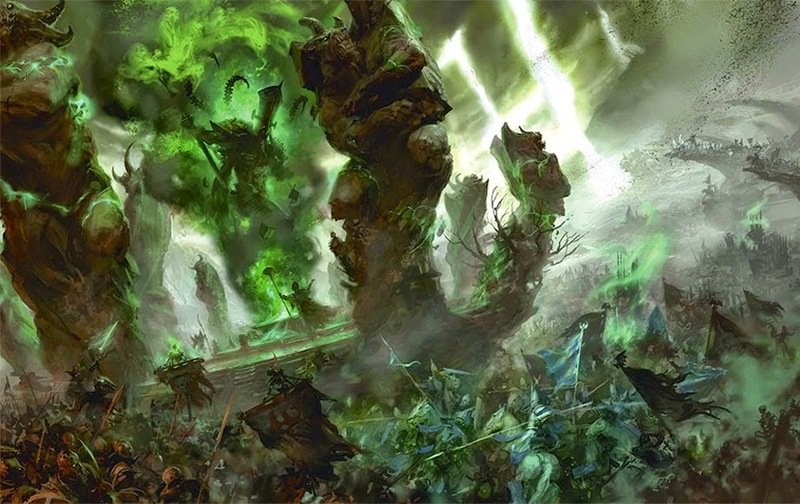 The first and second chapters deal with Arkhan's plan to resurrect Nagash, aided by the erstwhile Mannfred von Carstein they face off against Brettonia, Skaven, the Empire, Wood Elves, Dwarves, Skaven, Beastmen and High Elves before succeeding in bringing the Great Necromancer back to life. I enjoyed the first two chapters as they managed to show us how the End Times were beginning to effect nations across the world and gave us some tantalising hints to wider events involving the factions Arkhan and Mannfred encounter. Chapter three sees Neferata finding a new power source for Nagash in the form of a dwarven ancestor goddess. It was great to see Neferata again after reading about her in the Time of Legends: Nagash series but she seemed to display a certain level of incompetence when compared with the other Mortarchs and we didn't really get to see the intrigue she excels at. Whilst it was a shorter chapter, perhaps the weakest, and was not packed with too much plot it was still an enjoyable read and I particularly liked the goblin encounters that hinted at larger greenskin events in the future. 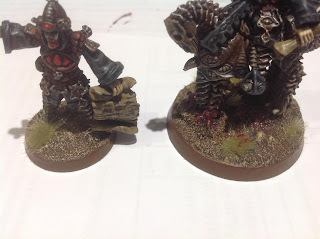 Chapter four changed focus to the Empire and their war with Chaos with the undead under a resurrected Vlad von Carstein serving a supporting role. The return of Vlad was reasonably well executed if perhaps a little unnecessary but in many ways this was really the story of Balthasar Gelt with Valten and Karl Franz existing on the fringe of the narrative. I really enjoyed Balthasar Gelt's storyline which I felt had clear logical progression and wasn't just a lazy muh ha ha ha ha I suddenly and inexplicably became evil story that GW has pulled once or twice in the past. I get the feeling that we will see more stories like this as the End Times progress. I for one hope that the next book will focus on the elves as they seem to be getting lots of interesting set up, particularly regarding the lengths Teclis seems to be willing to go to in order to defeat chaos. Malekith thus far has been conspicuously absent, as one of the great villains of Warhammer with comparable scope and power to Nagash, I was surprised to see him do very little. I fully expect the Witch-King to get his own End Times book sometime in the future or at least go out with a suitably big bang. SETTRA DOES NOT SERVE. SETTRA RULES! My favourite piece of art from the book. Despite his humbling Settra lives and is seemingly going to try and regain his throne with the aid of the chaos gods. It was saddening to see the Tomb Kings so utterly crushed and their cities destroyed but I look forward to seeing if Settra can rise again (hopefully as some kind of massive Daemon Prince, like an awesome sun-themed Egyptian version of Nagash) to reclaim his kingdom and take revenge on the usurper. Overall the story was pretty solid with the fluff beginning to take bold and bloody steps in new directions. It has left me wanting to buy any more End Times books that may come out even if they are not associated with any of my armies, which I suppose is what GW wants. I look forward to seeing the conclusion of this epic tale and I would just like to reiterate how gorgeous this publication is; the effort that has gone into it is apparent throughout. My only criticism of the story would be one or two of the deaths felt forced or were wasted opportunities. I ramble more on this in the last section. The scenarios taken from the story look great with lots of 'fluffy' and characterful rules, not just for the scenario but also for some of the unique units that take part in the battle like Neferata's Tomb Guard who have their own extra rules. Whilst I am unlikely to play many of these scenarios exactly as they are meant to be played (mostly due to the armies my regular opponents play) I would certainly like to adapt some of them. Rules for underground fighting look interesting as well and I can see Skaven, Dwarf and Goblin players enjoying using these for scenarios or simply to make regular battles more interesting. It was a shame however that Luthor Harkon is treated as just a flying vampire in the scenarios. I do hope that Nagash's pirate-themed Mortarch gets an awesome model and unique rules in future as I have always found him a fantastic background character and now he finally takes centre stage it would be nice to see him represented in miniature form. Hopefully he won't die in the next book before he gets proper rules. Combined profiles for three of the Mortarchs with their mounts is interesting and I wonder if this will be the direction they choose to take riders and mounts in the future. It raises some interesting questions but also solves a few problems riders and mounts currently have. The only criticism of the system I can offer thus far is that Arkhan and Neferata's combined profiles with their mounts gives them only a 6+ save despite visibly wearing armour, being mounted and the mount itself having armour as well. Whilst a better armour save would have made them almost unkillable I would have thought it would better represent the models. The new Undead Legion rules I can see as being great for both Vampire Counts and Tomb Kings: the former gaining ranged units in the form of archers and catapults and the latter losing many of the weaknesses their fellow undead already didn't have. I won't go off on one about competitiveness of rules or a full analysis as it has already been covered in depth by people far more knowledgable than me, but I would like to say that the new rules look like a lot of fun and I certainly intend on using some of them in the future. I think it is great that we have been given a couple of new ways to play the game and I always enjoy a bit of variety within my games. Not wholly convinced about letting every wizard in the game summon the undead, seems a bit dodgy fluff-wise just like everyone suddenly becoming a Daemon summoner in 40k. That does seem a bit of a money-grab as does increasing Lords and Hero points allowance which could lead to a return of HeroHammer and seems wholly designed to help shift models of high-points characters like Nagash. 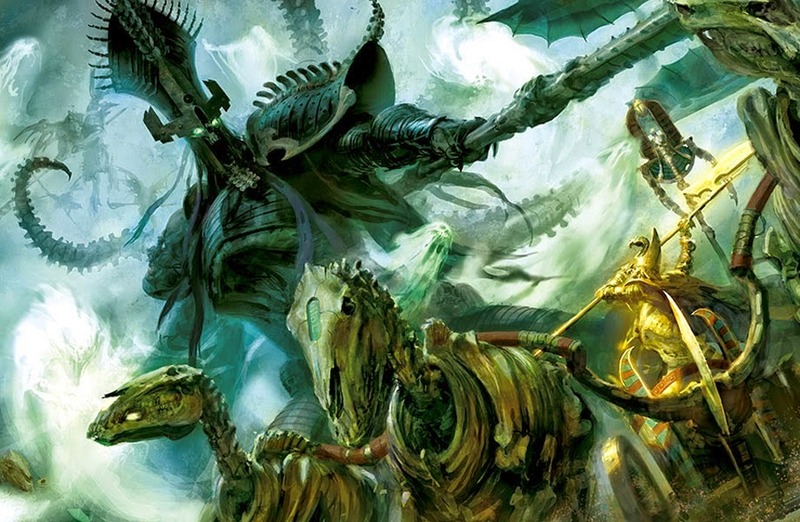 By the end of the End Times I fully expect to see new models for characters like Malekith and Engrimm van Horstmann riding huge dragons who are high-points value, who cost lots of money and who GW want you to buy. Whether we see an actual return to HeroHammer or not I don't know but it will be interesting to see how lists react to this. On an additional note I think it was a bad idea to make the Lore of Undeath Magic Cards a limited edition thing. Not just because I missed out on them but because I would have thought they would sell a lot of them if every faction can take them. A missed opportunity in my opinion. Across the internet I have seen The End Times made into an acronym in a variety of different ways, so far I have seen: TET, WET, EOT, WTET and even WTEOT. I'm not sure if a consensus has been met yet but in my opinion we ought to use either WTET (Warhammer: The End Times) or TET (The End Times) both of which can have an extra letter added to denote which volume is being referenced. TET:N (The End Times: Nagash) for example. It was certainly nice to see the return of Valten and Crom the Conquerer with associated rules; both of whom I always thought were interesting characters that needed to come back though it was a shame Crom died almost as soon as he appeared. In fact the death toll thus far has been quite astounding and I was really surprised quite how many special characters and important background figures died over the course of the book. Notably it was those special characters who don't have models or those with older models who bit the dust; the only noticeable exception being Volkmar the Grim. Some of the deaths were well executed and felt like natural additions to the story, other however felt a bit forced like Walach Harkon and Khatep who both fell to no-model-means-death syndrome which has afflicted both fantasy and 40k prolifically this year. I was slightly disappointed by Eltharion's death, whilst it was pretty badass with him and Stormwing nearly killing Mannfred and taking on Arkhan the Black I was disappointed he fell prey to a swift dusting and didn't get to live out the blind swords-master storyline GW retconned a few years ago. I will talk more about the models another time but as a minor point I thought I would at least mention them. The packaging of the new models is quite nice and shows off the models without any of the weird background effects GW used a lot for a while. It looks clean, modern and professional which I like. Price-wise the new models are all roughly what I expected. It is a shame Nagash and his Mortarchs are so expensive but for their size it is what I have come to expect from GW these days. The Spirit Hosts are in fact cheaper than I thought they would be and the Morghasts are as expensive as I imagined. Of all the new releases there isn't a model I don't really like except Mannfred whom I never really liked the metal model of anyway, perhaps he needs a massive hat like everyone else seems to be getting these days. 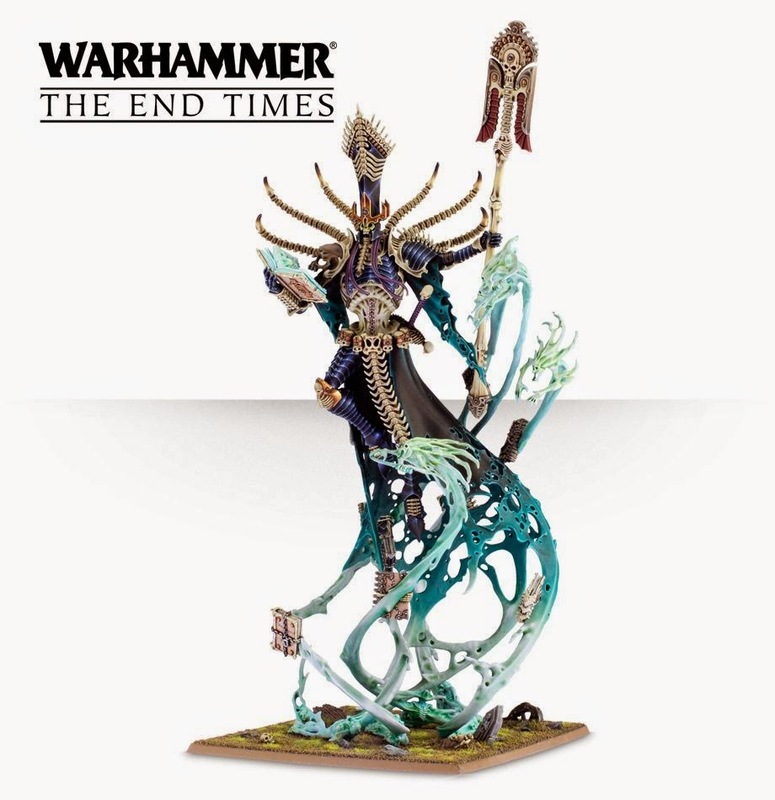 I will be buying Nagash eventually and probably Neferata as well as they are my two favourite models of the release. The Spirit Host will probably eventually find themselves into an army but having just recently become a student I don't know when I will be able to afford anything. The End Times has given me a slew of new ideas for my armies and I wouldn't be surprised if over the next few weeks and after each new End Times release we see all manner of interesting and inspired armies appearing. Personally I intend on adding a few new things to my Tomb Kings at some point with ideas such as Corpse Carts as Liche Priest Chariots, Spirit Hosts as Desert Spirits and Terrorgheists/Zombie Dragons as winged sphinxes or huge carrion birds. Conversion opportunities abound and I think I may even do a post on this in future. In conclusion I think that this first End Times release has been very strong and sets a good precedence to follow. Should the quality be maintained throughout the End Times series I can see it being a very successful run that could breathe the new life into Warhammer Fantasy it so desperately needs. Solid 9/10 - only a few minor nitpicks keeping it from a perfect 10. Bring on the End Times!